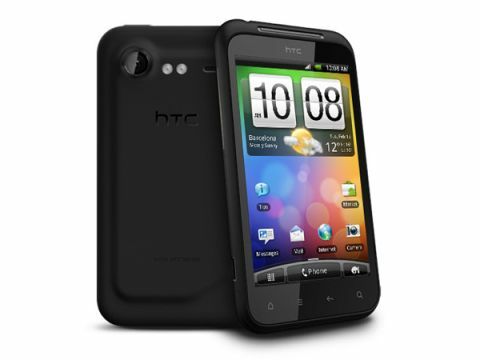 The HTC Incredible S is the latest Android phone from the Taiwanese brand, filling the 4-inch screen gap it has in the UK. The brand has already launched a phone under the Incredible moniker in the US, making it slightly odd that it's chosen to bring that product line to the UK - but given the success of the Samsung Galaxy S and a slew of forthcoming handsets with a 4-inch screen (Such as the LG Optimus 2X) it's easy to see why it's gone down this route. What's slightly odd is that the HTC Incredible S actually resembles something closer to the Motorola Defy, the ruggedised handset of the moment, rather than the slick stylings of the Galaxy S - the chassis is encased in matte plastic that feels closer to rubber. But, at only £25 a month,it's not going to hurt your pocket compared to other high end handsets on the market at the moment. The first thing most will notice on the Incredible S is the rear - it's got a 'vacuum packed' feel to it, with the chassis adhering to the outline of the battery and innards in a fairly unique way. It's a strange experience in the hand - the phone feels thin when you first look at it, but when actually holding it in the palm, the thickness becomes very apparent. However, the comparisons with Motorola's rugged rug rat don't mean the Incredible S is an unattractive device. The four inch screen is well worked into the black exterior, and the four Android keys we've come to expect from HTC (Home, Menu, Back and Search) and once again touch sensitive options. We still hanker for the physical keys of the original HTC Desire, but like a dedicated camera key, most brands seem keen to do away with anything that actually clicks. The keys are actually easy to press no matter where you palm is positioned, and respond with a very pleasant tactile buzz. A much cooler trick though - the symbols auto-rotate when you move the phone, despite being only cut-outs to let the light through. Having spent far, far too long trying to work out how this happens seems to show that the openings actually rotate on a little circle, which is pretty darn cool. The rest of the phone is quite sparse when it comes to extra keys and buttons. HTC has placed the 3.5mm headphone jack back on the top of the Incredible S, after moving it to the bottom for the Desire HD - perhaps there's a feeling that any screen above 4.3 inches can't handle a headphone jack at the top. It's positioned nicely to the left-hand side though, and very rarely gets in the way for things like watching videos or browsing the web in portrait mode when listening to music. The top edge of the Incredible S also sees the lock/power switch - great ergonomics here again, with a simple lift of the index finger (for the right-handed) easily locating it to turn off the phone screen. The volume rocker key is on the left-hand side of the phone, along with the uncovered microUSB slot for data and charging. We're still not sure why companies leave this covered on some models and open on others, but it's snugly designed into the chassis here. As we mentioned, there's no physical camera key to speak of here, so the right-hand side of the phone is as sparse as an Elephant bar on Mouse night. Apparently they really are scared of mice, not just in the minds of Disney writers. The back of the phone sees the rather large camera sensor in the top left, alongside a blindingly powerful dual LED flash offering. Next to that is the loudspeaker grill, which is really rather loud (more on that later). Removing the battery cover is relatively easy thanks to a slot at the bottom of the phone, and in doing so you'll see the microSD slot in the bottom left-hand corner. At least we don't have to remove the battery to swap media cards, but surely a covered slot would have been better on the Incredible S.
While we're not sure the HTC Incredible S will win any style awards this year, it has an oddly pleasant feel in the hand thanks to the smooth rubberised finish, and we're fans of the 4-inch screen size. And while HTC hasn't made much of it, it seems there's a dock connector here, with two small pin holes on the battery cover linking into the Incredible S' internals. HTC has told us that a dock is indeed coming, but there's no timescale as yet for that to land.